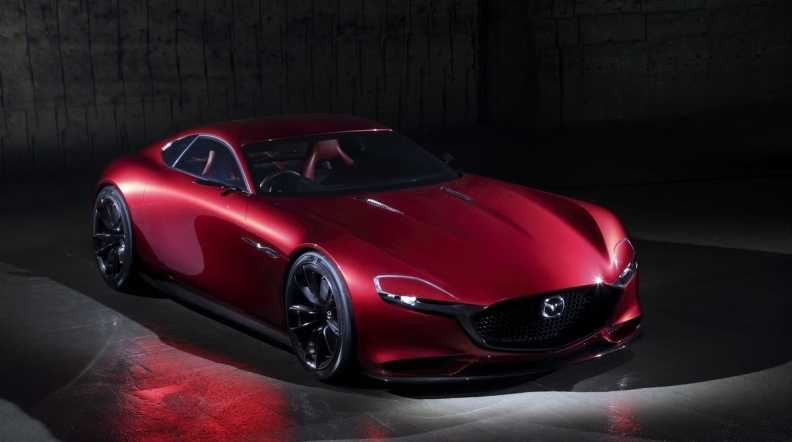 TOKYO -- Three years after pulling the plug on the rotary-powered RX-8 sports car, Mazda Motor Corp. signaled today at the Tokyo Motor Show that it hasn’t given up on the peculiar engine design that gave the brand some of its grandest successes. 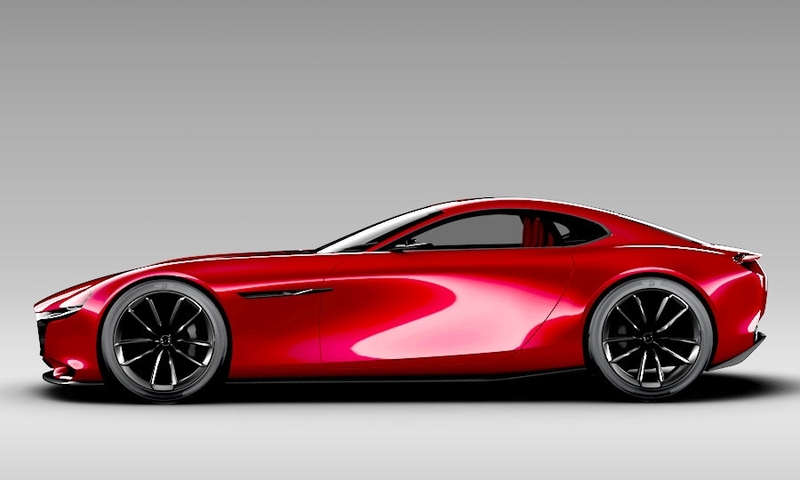 Mazda unveiled a concept for a low-slung sports car called the RX-Vision, with a next-generation rotary engine called the Skyactiv-R.
Mazda didn’t share any specifications or production plans for the engine but said it aspires to make the gasoline engine efficient, clean and reliable enough to sell. 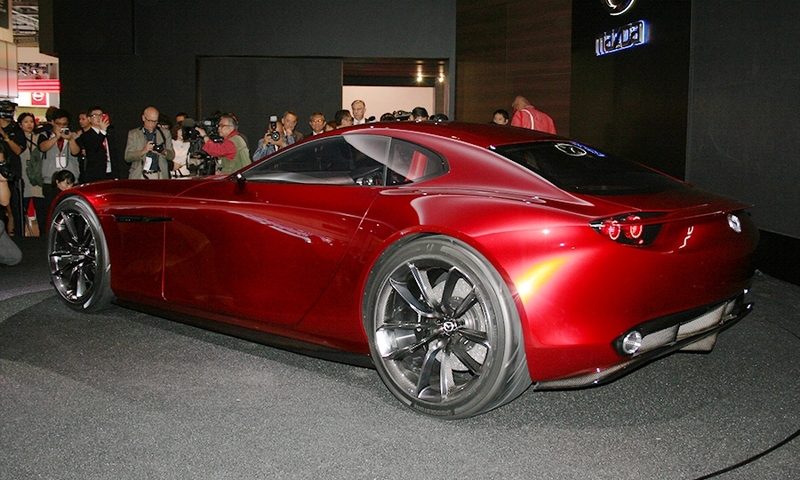 The RX-Vision uses the front-engine, rear-wheel-drive configuration commonly used in sports cars, including Mazda's own MX-5 Miata. However, at 173 inches long and 76 inches wide, it is a foot and a half longer and 8 inches wider than the newly redesigned MX-5. 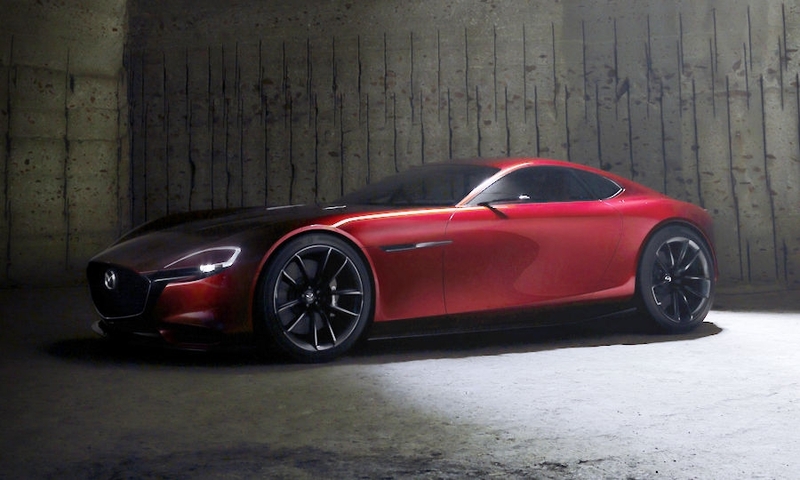 Rotary engines, also known as Wankel engines after inventor Felix Wankel, use triangular rotors continuously spinning inside an oval housing, unlike most gasoline engines, which rely on the back-and-forth pumping action of pistons. 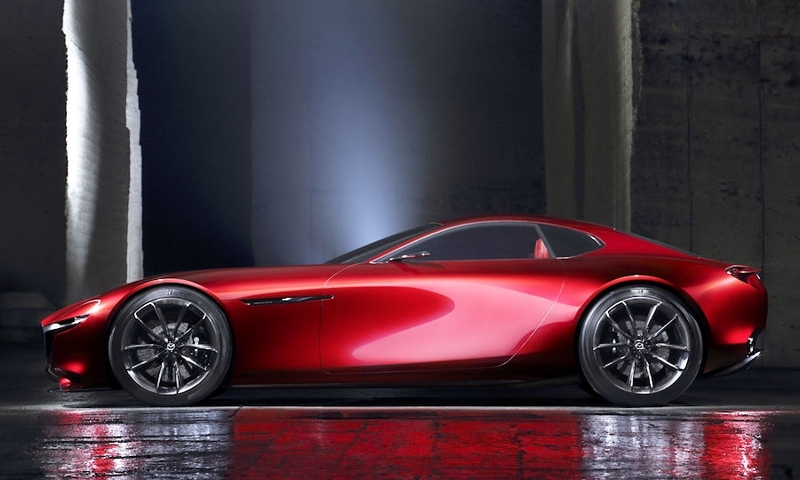 Mazda CEO Masamichi Kogai with a Cosmo Sport last week after a parade to promote the 2015 Tokyo Motor Show. Mazda’s first production car with a rotary engine, the Cosmo Sport, arrived in showrooms in 1967, three years after its debut as a concept at the Tokyo Motor Show. 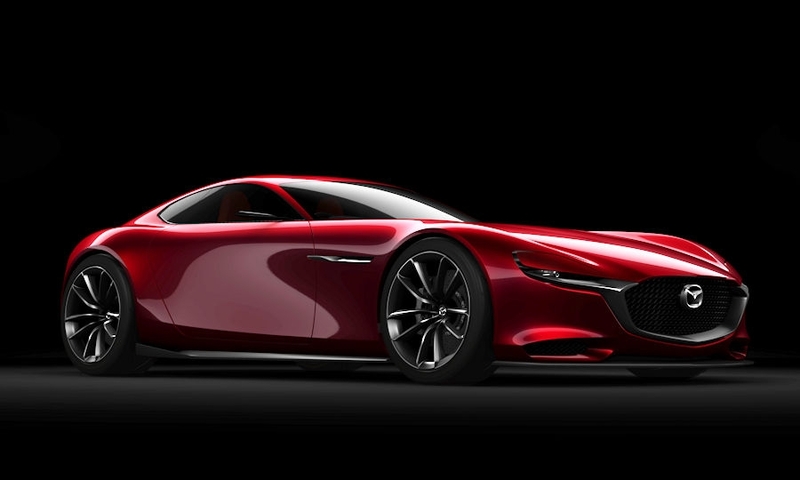 At that time, Mazda, like the rest of Japan’s major automakers, was determined to show it could build more than economy cars. That same year, Toyota introduced the 2000GT, which became the first Japanese car to be featured in a James Bond film with its inclusion in the Japan-themed You Only Live Twice. Nissan followed suit in 1969 with its legendary Z coupe, sold in Japan as the Fairlady Z and in the U.S. as the Datsun 240Z. Mazda sold just 1,519 units of the Cosmo Sport by the end of production in 1972, but the car paved the way for the rotary-powered RX-7, one of Mazda’s biggest successes. 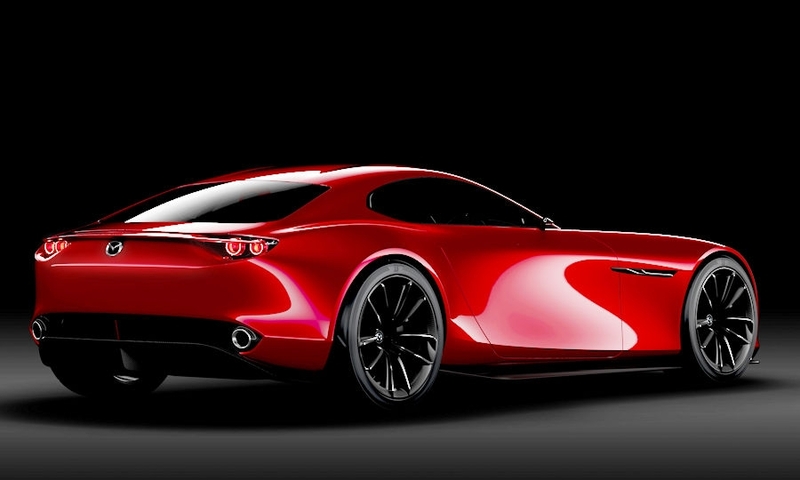 Its successor, the RX-8, was discontinued in 2012. 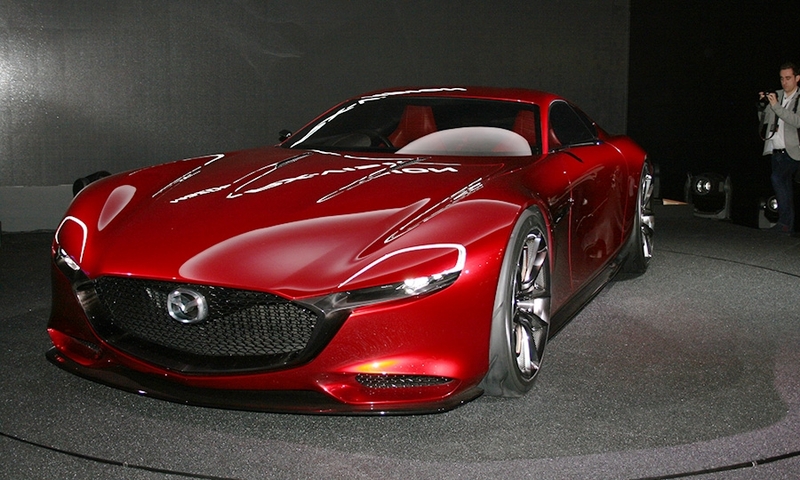 Mazda sold just 759 units of the RX-8 in the U.S. in 2011, down from a high of 23,690 units in 2004, as the rotary engine’s poor fuel economy and high emissions became a larger handicap. 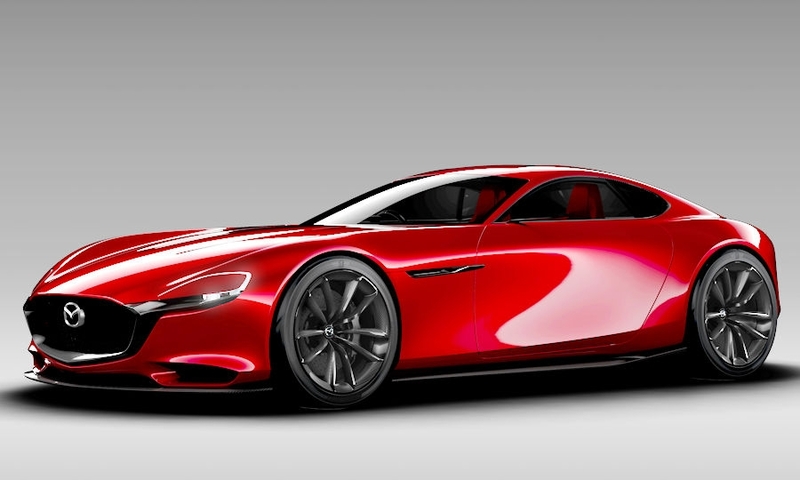 Mazda continued its research into a next-generation rotary, mainly as a compact range extender. 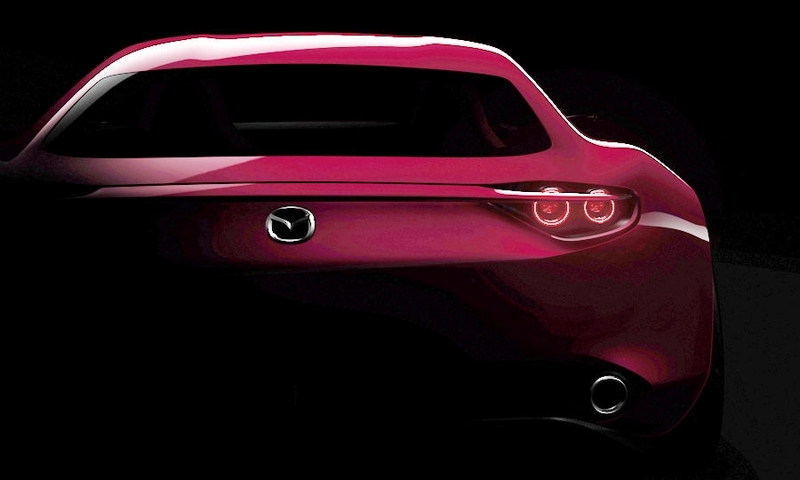 In 2013, the company showed a prototype of a hybrid Mazda2 with a 0.33-liter rotary engine to recharge the batteries on the fly. 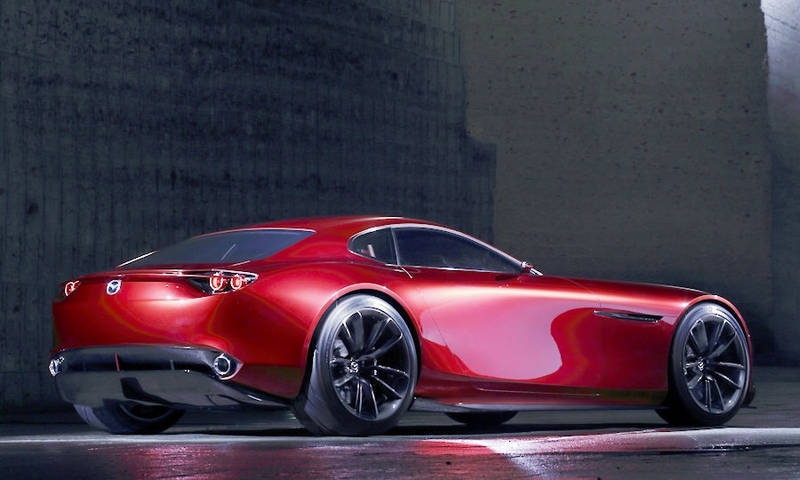 However, Mazda has disavowed plans to build a rotary-powered successor to the low-volume RX-8. 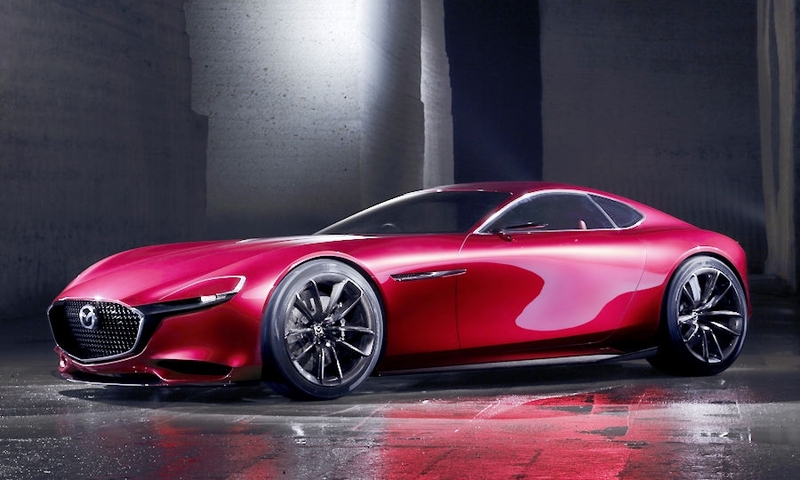 “We don’t have that kind of vehicle in our future product plan,” Mazda CEO Masamichi Kogai told Automotive News last fall. 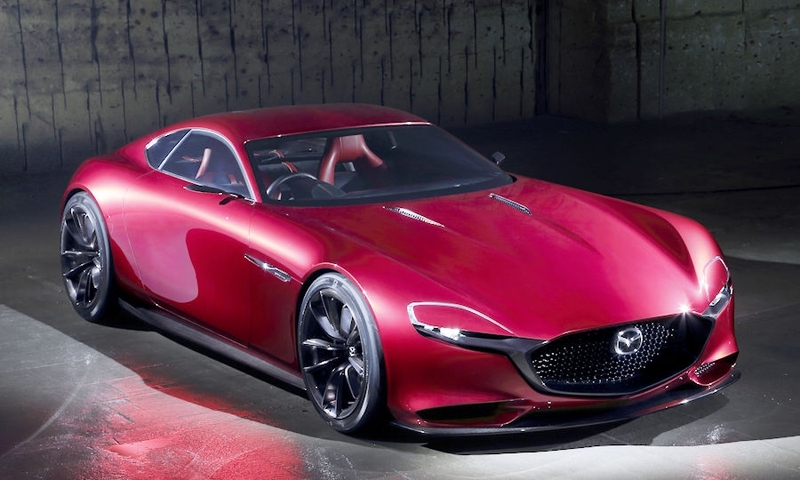 Because the name RX stands for “rotary,” said Mazda’s chief designer, Ikuo Maeda, the company would not resurrect the nameplate without such an engine. 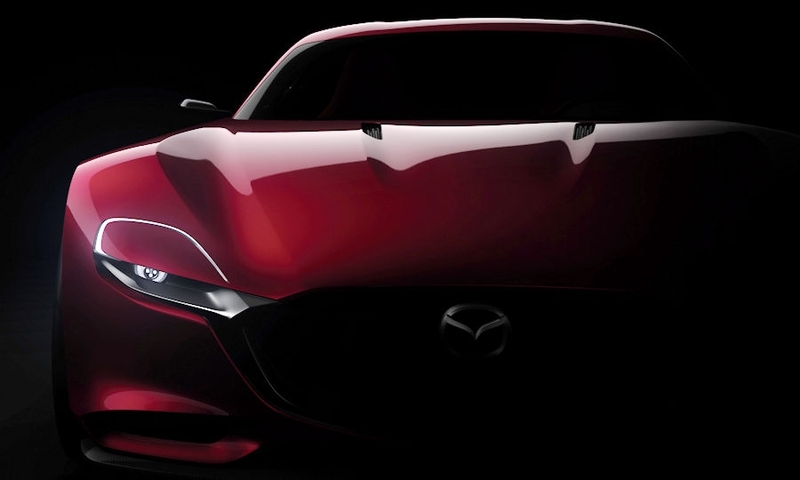 The new concept uses the front-engine, rear-wheel-drive configuration commonly used in sports cars, including Mazda’s own MX-5 Miata. However, at 173 inches long and 76 inches wide, it is a foot and a half longer and 8 inches wider than the newly redesigned MX-5.